Ali Qapu (Âli Qapı from Ottoman Turkish High Porte) is a grand palace in Isfahan, Iran. It is forty-eight meters high and there are seven floors, each accessible by a difficult spiral staircase. In the sixth floor music room, deep circular niches are found in the walls, having not only aesthetic value, but also acoustic. The building, another wonderful Safavid edifice, was built by decree of Shah Abbas the Great in the early seventeenth century. It was here that the great monarch used to entertain noble visitors, and foreign ambassadors. The chancellery was stationed on the first floor. On the sixth, the royal reception and banquets were held. The largest rooms are found on this floor. The stucco decoration of the banquet hall abounds in motif of various vessels and cups. The sixth floor was popularly called (the music room). Here various ensembles performed music and sang songs. From the upper galleries, the Safavid ruler watched polo, maneuvers and the horse-racing opposite the square of Naqsh-i-Jahan. 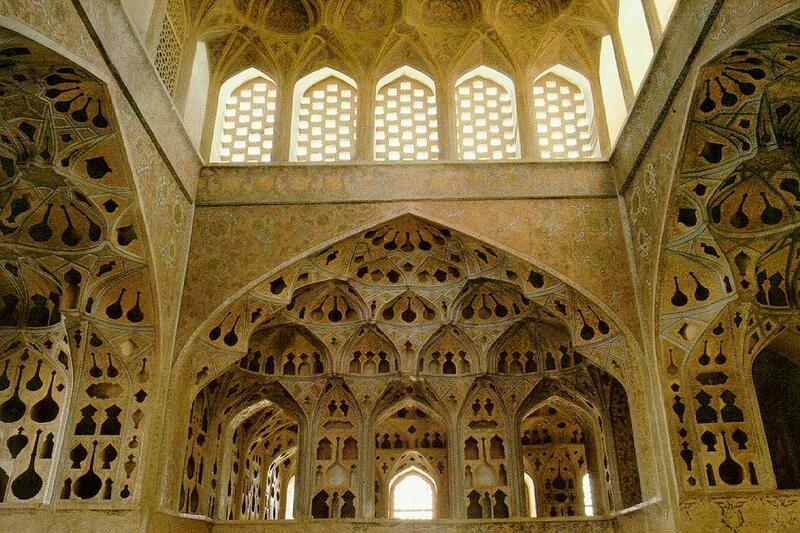 This entry was posted in Architecture, Culture, Travel and tagged Ali Qapu, Architecture, Esfahan, Iran, Isfahan on May 28, 2014 by socialinform.